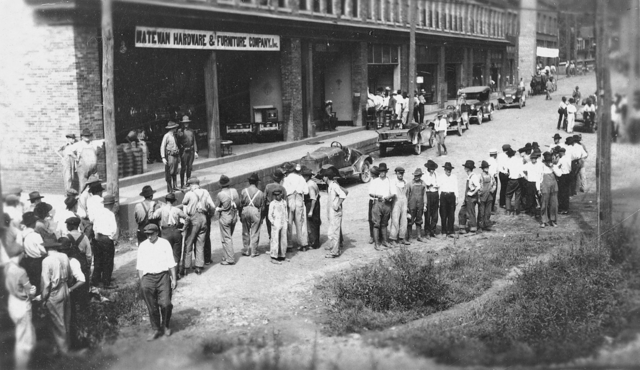 Miners line up for strike relief in Matewan, about 1921. But Keeney retained a strong following among miners. By March 1931, UMWA membership in West Virginia had dwindled to fewer than 600 members. Keeney launched his new union and, within weeks, had enrolled more than 20,000. He called a major strike that summer, but the costs virtually bankrupted the upstart union. Within two years, his union was broke, and the UMWA again became the dominant miners union in West Virginia. A few years later, Keeney dropped out of the labor movement entirely. He died in 1970 at age 88.